February 20, 2015, 7:21 PM · Happy Chinese New Year! The Los Angeles Philharmonic ushered in the Year of the Ram (or Goat or Sheep -- there seems to be some confusion!) in a concert called "Chinese New Year: From Tchaikovsky to Tan Dun," with a combination of East and West, classic and modern, predictability and surprise. A Chinese New Year's concert (there will be two more performances, tonight and Saturday night) was a new event for the LA Phil, which is known for its continuing efforts to innovate and reinvent the symphonic experience. This eclectic concert seemed perfectly fitting at Disney Hall, otherwise known as a "living room" for Los Angeles, a city where classical music lives comfortably alongside movie soundtracks, and where diversity of culture thrives. This was a party, and it had the trappings. Big red "Happy New Year!" 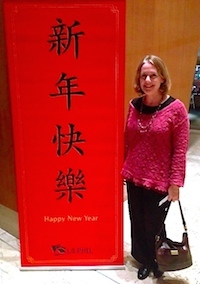 banners, with the message in both Mandarin and English, stood at various entrances, and ushers wished patrons a "Happy Lunar New Year!" as they passed out programs. 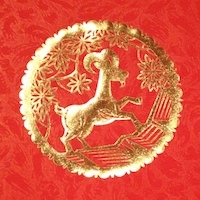 Inside the programs were red envelopes, decorated with the golden ram, containing messages or coupons. In the hall, red lanterns hung from the lofty ceiling. I came out of curiosity to hear Chinese-born violinist Ning Feng perform live, and I was not disappointed. No -- actually I was a little disappointed, but only because I wanted to hear more! He played Saint-Saens' "Introduction and Rondo Capriccioso" with beautiful expression, agility and character. The "Introduction" sounded quite sentimental on the 1721 "MacMillan" Strad that he plays, and the the mercurial "Rondo Capriccioso" had great ebb and flow. I'm completely envious of his up-bow staccato (which is also on display in this YouTube video) and he also tossed off every other mad task in this virtuoso piece with complete ease and musical purpose. Bravo to the LA Phil woodwinds for their playful soli during the violinist's bariolage accompaniment section. Pianist Haochen Zhang made Chopin's Andante spianato and Grand Polonaise, Op. 22 seem easy and inevitable, pouring forth like water. A major highlight for me was cellist Jian Wang, whose singing tone, at once strong and nuanced, brought the audience to a hush for the "Rococo Variations" by Tchaikovsky, a piece full of both humor and beautiful melody. For pure fun, all three soloists played with the orchestra for Chinese composer Tan Dun's "The Triple Resurrection," a 2013 piece which features quotes from his best-known movie scores such as "Crouching Tiger, Hidden Dragon," "Hero," and "The Banquet." Without yet reading the program notes, I sensed that Ning Feng's opening violin solo was a water theme, which beautifully weaves in and out of the piano and cello solos. I concluded that I'd been correct when I heard something that most definitely was a water theme, the actual sound of moving water. How exactly did they sneak two enormous glass bowls of water into the percussion section without my noticing at all? A microphone was trained on each bowl, with musicians swishing their hands through the water to make sounds like a kid in the bathtub (minus the squeals). The surprise of this sound and sight seemed to delight a lot of people, myself included. There was a giant orchestral crescendo that climaxed into: a solo water swish -- definitely original! The piece kept getting better, strings soaring melodically over all kinds of driving percussion and syncopation. The end was met with an immediate standing ovation. As an encore, the orchestra brought back the same Spring Festival Overture that opened the concert, this time joined by four dancing dragon puppets in green, gold and red, each manned by two gymnasts. They made their surprise appearance in various aisles, then worked their way toward the stage, where they danced, "slept" (their puppet eyes closed) and frolicked to the music. A long orange dragon, held aloft on sticks by some half-dozen people, stretched across the entire length of the floor as it paraded down and across the aisles. here in Japan it`s the year of the sheep so that is probably in the right ball park. February 21, 2015 at 12:05 PM · Since you live in LA there must be so many great violinists that come through. Do your top students ever get a lesson or master class? February 21, 2015 at 03:14 PM · Ning Feng's sudden change of bow hold when executing the up bow staccato in Hora Staccato is similar to what Heifetz did in a similar situation, but perhaps looking a little more elegant. February 21, 2015 at 09:59 PM · There are so many great violinists that come through, I'm very lucky to live here. I also don't seem to have enough hours in the day to go to every event that I'd like! Last night I saw a wonderful master class with Arnold Steinhardt (stay tuned, you'll here about it!) at USC! It was really a joy to hear the three student ensembles there, they were quite accomplished.